Welcome to Criminal Thoughts, the regular feature where I, and the amazing Vic Linde, dissect the pathology of Criminal Minds, an everyday story of FBI Profiling folk. Vic’s in italics, I’m not. Here we go. This week’s episode of Criminal Minds – Fate – had a lot to do after the seriously lacklustre offering of last week. They divided the plot a lot more this time, some with the team and then we saw a lot of our un-sub as well as Rossi’s personal storyline. Did the balance of this work for you? Actually, yeah it did. I agree with you this one had a lot to make up for and while there were a couple of wobbles I thought it did pretty well. The Rossi plot in particular went some pleasantly surprising places. I loved him spotting his tail (Also, DAVE ROSSI, CLASSIC ROCK GOD!) and the pragmatic way he went about chatting to her. I especially liked how that was contrasted with the closing scenes. Done wrong those could have been HORRIBLE, and the dreadful soft focus flashbacks sure tried to make them that way, but I thought they worked really well. Rossi’s been such a rock solid, largely emotionless pragmatist since he arrived that seeing him break down was really poignant. Also. Dave was in Paris thirty years ago. Emily is the daughter of a diplomat stationed in Paris…While I’m not for a second suggesting Prentiss is his kid, there’s surely some ‘Dave and Emily’s kickass mom investigate Parisienne crime’ fanfic somewhere. The difference between the awkward Meg scenes and how well Rossi’s daughter appearing was handled was profound. I really liked her – we can definitely see more of her in the future. It was also great that the two parts were quite separate – she wasn’t dragged into the case and it wasn’t a direct parallel which made it feel more real. Absolutely, and yeah I completely missed the Dave’s family healed/Meg’s life falls apart symmetry. EXCELLENT spot:) I agree too, she’s great. Smart and grounded and interesting. I LOVED that just when we were heading into cliche territory at the end the script took a hard left turn. The fact she’s happily married, has a good kid and is completely well balanced was a really, really nice surprise. I also really liked the ‘I need a car’ moment. Hotch, at this point, has such remarkable trust in his team that he’s quite happy giving them something they need, trusting they have a good reason for it. 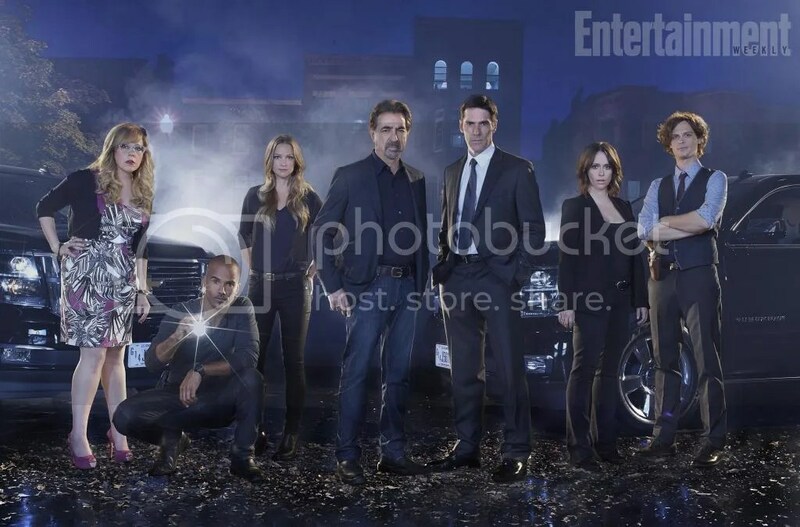 Hotch has been let down by various members of the team in the past and yet he still lets them have their own space, he lets them do the right thing and sometimes the wrong thing. It sounds a little odd but I also really liked the fact that Ellen killed her husband and nearly killed her daughter. It shifted the whole tone of the show and somehow made her a lot more sympathetic. She wasn’t killing people she hated, she was acting on a compulsion that she just couldn’t control. And in the end seeing her captured was less about bringing the murders to an end and letting us see what Ellen would have to live with. Absolutely! Ellen was a really interesting unsub and a welcome return to the tragic, wounded figure. We’ve had a few too many carnival monsters this season so far and seeing someone who genuinely couldn’t help it was really welcome. I also loved the extra context we got about her husband’s behavior towards the end. That first time we see him where he’s nervous and refusing to confront her speaks to extensive periods of (unintentional) emotional stress in the household. That makes his final confrontation with her all the braver and, ultimately, more tragic. It was also great to see Sarah at home, so we saw that she wasn’t a terrible person, that she was just caught up in this awful thing going on. It made the pattern clearer to the audience rather than just explaining more to the team. As ever, the supporting characters really make the show. Fascinating isn’t it that when the show fails its because the supporting characters are weak. I did get worried when the bitchy female boss from 1980s Central Casting wandered in but the rest of the episode they all worked really well. It was also a nice reinforcement of JJ still being the designated ‘team people person’ that she’s the one to start picking up the pieces at the end. And, oh Garcia, buying two of Rossi’s daughter’s book because she felt bad about the sales. One would be a punch-line, two makes it cute. So, slightly odd question here. How safe do you think Dave’s family are? We saw his ex wife which means they clearly plan on showing her to us again, and his daughter has a very grounded, healthy home life. Weirdly, I don’t get the same YOU WILL END SOON vibe I get from Derek Morgan And The Worst Present Ever. I was wondering what your thoughts were? You know, I’m not entirely sure that we will see his ex-wife because we saw a younger version of her. I do like the idea of them getting back together though, that would be so good. I felt exactly the same, family attacks tend to be DMV based rather than further afield. I like the idea of his daughter and her family being a bit like Reid’s Mom, someone we see when we’re out near to their home. I love the Reid in Vegas bits and I’d love to see that for Rossi as well. And you’re totally right, even aside from fanfiction, having Ambassador Prentiss and the ex-Mrs Rossi in an episode about a serial killer who first struck in Paris while they were both working there would be AMAZING! And yeah I’d like Dave to have a family too. The characters that do have all benefited from it. It may just be us but I like to think that they keep having little hints of Prentiss because she might come back again. We can hope. I think it’s positive that we are seeing signs of characters having families but I do hope that it’s so that they can have more complex lives that extend outside of the BAU rather than giving the writers more people we care about to kill. Also, I feel like we need to check in on Reid sometime. It’s been a rough couple of years for him and neither JJ nor Morgan seems to have done much on-screen to watch out for him, I’d like to have a little hint that he’s healing okay. You know what this could all be solved by? Make it happen, writers room. Nothing more to say. Just yes, get our lovely team back to the bar and initiate Kate into the BAU Karaoke. Then drunken late-night pasta at Rossi’s house where they all look at the pictures of his daughter growing up that he brought back from his trip to see her. The team all falls asleep in his living room with Tangled playing in the background, only Morgan and Hotch still awake and analysing all of the characters. Thanks as ever to the wonderful SSA Vic Linde and to you for reading. We’ll see you next time on Criminal Thoughts for episode 10, Amelia Porter.